The traditional Greek diet served as the prototype of the Mediterranean Food Pyramid (along with Southern Italy) as it is known today. Olive oil is the main ingredient, present in almost every single dish. Greeks consume large amounts of olive oil and have the highest consumption per person in the world. The traditional Greek diet was mostly vegetarian, it was most likely due to the fact that the average Greek couldn’t afford to eat meat very often. One other factor was religion; there are over 180 days of fasting a year for Greek Orthodox Christians. Here I share what the Greeks ate traditionally, however while many Greeks still eat like this (I am one of them), many do not (see last paragraph). The majority of traditional meals are vegetable stews/casseroles that are called lathera (or ladera), which translates to “with oil” from the Greek word for oil lathi (ladi). Vegetables such as green beans, eggplant, okra, and peas are prepared with tomato, onion, garlic, and various herbs and spices, consumed as a main dish together with feta cheese and bread. Salads are always seasonal. In the summer a simple tomato-cucumber salad that may also include onions and green peppers and in the winter cabbage with carrot or seasonal horta, wild greens, boiled and consumed with olive oil, lemon, feta cheese, and bread. Legumes are also a popular dish traditionally consumed at least twice a week. Beans such as lentils or broad beans are prepared with tomato, onion, and olive oil, and also accompanied with cheese and bread. Olive oil is a main ingredient in the Greek kitchen. It is used in cooked dishes from casseroles to meat to salads as well as desserts. Butter traditionally was used by the more affluent. Pites, vegetable pies are also popular, especially in northern Greece, because they lasted a long time without refrigeration and provided a way to use any leftover vegetables or other ingredients. The most popular are spinach pies, cheese pies, and leek pies, which are very popular snacks for the modern Greek. Bread and cheese are present at every single meal. An alternative to bread is the paximadi, which originally was old bread rebaked. Μeat was not consumed very often, usually only during celebrations. Popular choices include lamb, goat, chicken, pork, and veal in northern Greece. The meat is usually prepared roasted in the oven with lemon, garlic, and oregano, or as a stew in tomato sauce. Meat is almost always accompanied by roasted potatoes. For mainland Greece, fish was mainly consumed in a cured or salted form, whereas on the islands there were more fresh fish available. Dairy was mainly consumed in the form of yogurt or cheese. Greeks are among the highest consumers of cheese, thanks to feta cheese, which accompanies almost every dish. Traditional sweets include Greek spoon sweets (a type of fruit preserve), olive oil based cakes and cookies, as well as sweets with syrup and honey. Fruits were also consumed as a snack or after a meal. It is important to note that the herbs and spices play a very important role in the traditional foods and dishes of Greece, the most commonly used are garlic, lemon, onion, oregano, parsley, laurel, mint, dill, cinnamon, cumin, and allspice. What are Greeks eating today? 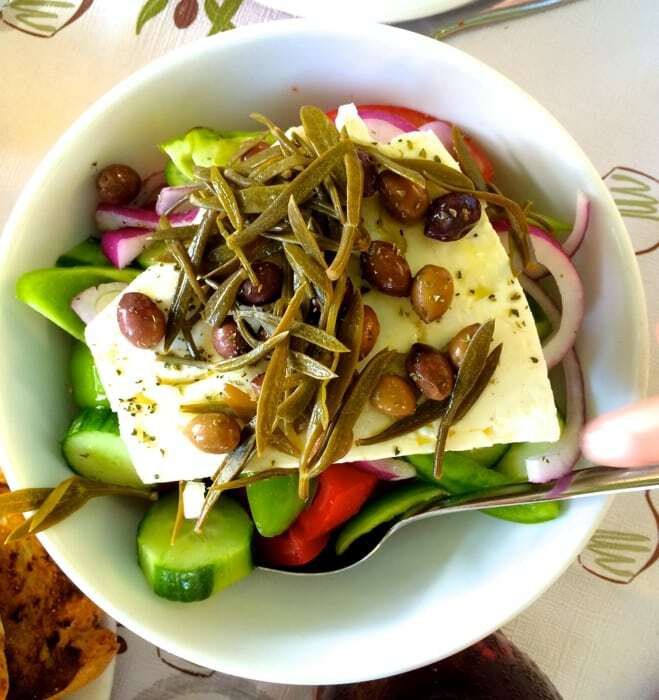 The current Greek diet has drastically changed in the past 30 years. Reports are noting that Greeks are consuming more calories and saturated fat. The overall prevalence of obesity is 22.5%, while that of overweight is 35.2%. This may be due to several factors: increased income, rise in the number of supermarkets, working women having less time to cook, eating out more often in fast-food restaurants, less exercise. Urbanization and economic growth led Greeks away from the traditional Mediterranean diet adapting a more westernized style of eating. Today highly processed food and fast food has unfortunately become a very important element in the Greek diet. The good news is that even with these new dietary habits, Greeks are once agin embracing their traditional diet and cuisine and there is a strong movement of promoting these traditional eating habits. Καλημέρα!! πολύ ενδιαφέρον site! !μπορώ κάπως να λαμβάνω newsletter, ΄διότι δεν μπόρεσα να το βρω!! σε ευχαριστώ! Ευχαριστούμε. Δεν έχουμε newsletter αυτή τη στιγμή, αλλά μπορείτε να μας κάνετε μας κάνετε follow στο facebook και twitter. Hello Elena, enjoying your site. This is a nice roundup. You correctly point out that apart from roast meat, stewed meat is very popular. But only roast is usually accompanied by roasted potatoes. Stews often combine meat and vegetables. Examples are chicken with okra, lamb with artichockes, lamb with Cos lettuce and aromatics (known as fricasée), beef or veal with aubergines – more exotically, beef with quince and chestnuts, chicken with purslane (glystrida) and courgettes. I think of these as among the finest creations of the Greek kitchen. Meat in the oven can also take the form of beef with small ‘rice’ pasta (kritharaki). One more thing: it’s calculated that about half the Greek population is lactose intolerant. So consuming yoghurt and cheese (rather than milk and cream) makes sense, as these are fermented products. Does this include goat and ewe’s milk cheeses? I (part Italian) am horribly intolerant of cow’s milk and had a very severe allergy to it as a child. Most cheese traditionally in Greece is made from sheep’s milk or a combination of sheep and goat milk. Elena, recently while visiting Greece we were served bacon everywhere and it was delicious. It was the same on all the islands, in Athens and on the cruise ship. Back in the US I am trying to find or replicate but I’m not really sure how. Maybe it was cured but not smoked? Can you help me sort this out? Thanks! Dear Mary, not sure I can help you on that one. Almost all bacon in Greece is smoked ( I have not found one that is not). Maybe the way they cook it? Thanks Elena. In the US I think it is mostly hickory smoked. Perhaps Greece uses a different wood or concentration. We sure enjoyed it. I’m researching a recipe and wondered whether you could help identify whether it is Greek and if so does it come from a region?, how old is it? Do you know any history behind it? Does it have a proper name? Most likely this recipe you are describing is not Greek, as in Greek cuisine we do not often use these specific spices along with lime often. And hummus is not Greek either. I am thinking this may be a middle eastern dish. Sounds yummy though! THANK YOU for saying hummus is NOT Greek! I am completely tired of middle eastern foods being labeled and marketed as Greek. People argue there is overlap-I think this is a big conversation and prob not as much overlap as most people think. It is a pet peeve of mine to see hummus listed on “ Greek meze” platters at restaurants. It makes me ask -why do I feel that with most other cuisines people know what they are and accurately identify them-not so with Greece. Or more often than not I see what I know as Greek-yet it is labeled Mediterranean-right alongside foods labeled as French , Italian, Spanish and Moroccan. Yet Greece has to be “ Mediterranean “?? It is long, winding conversation about why this is. Too big for here. I just wonder if other Greeks aside from me and my family here in Boston see this and are bothered by it. Thank you so very much for your wonderful site!! Have to say though that in some parts of Greece there is yoghurt on the table instead of feta cheese. To this day,I can not eat ladera with feta but with yoghurt. The commenter mentioning that only roast is traditionally served with potatoes and all the rest with vegetables,is actually right. But things changed and indeed my generation (30s) and younger children grew up eating mostly potatoes or rice or kritharaki with most meats,which is a shame. But yes,if we want to return to the original receipes we have to add more vegetables,like our grandparents used to do. The chicken marinade receipe,indeed sounds more middle eastern than Greek but we have had similar dishes in the Eastern Mediterranean Greek Islands. Cumin,coriander,mint,lemon (maybe lime too? ),hummus are something I would consider Greek ingredients actually. Both sets of grandmothers used to make delicious hummus dip for Green Monday and fasting periods. Greetings from a fellow Greek expat. 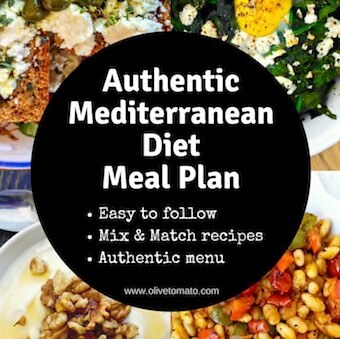 My husband and I are starting to change the way we eat and the way we approach each day based on the Mediterranean diet and lifestyle. I have a quick question – when stocking my kitchen with mediterranean ingredients, which types of cheese are the healthiest to keep on hand? Also, I have to eat gluten free, so are there specific bread recipes you like that are gluten free? I love your blog and recipes and am so excited to try many of them! Thanks Emily! Generally feta is the main type of cheese used. love the recipes as they remind me very much of Greece! Hello, Elena! Thank you for your time and efforts in providing this helpful information. You mentioned, “One other factor was religion; there are over 180 days of fasting a year for Greek Orthodox Christians.” and I was wondering if you might provide more information regarding this. Specifically, when and how it is done (i.e. fasting for a day, fasting for days at a time, fasting for specific meals, fasting of only a certain food or food group, etc.) I Googled the subject and came across conflicting accounts of what it looks like. I am very interested in fasting and would love to learn more. Thank you! I love this. My family is from is from Crete. More specifically Starvos/Akritori. Basically right under the airport and near the Naval station. When we would visit back in the 70’s/80’s my family made food the traditional way, there was not fast food or supermarkets. That I can remember anyway. I think it was all farmers markets or going to someone who had what you need. I grew up in San Diego which is similar or almost the same climate, i’d say San Diego is slightly cooler but so similar my grandfather when he arrived in 1920 stated it was just like Crete except with avocados. Eating a true Cretan diet can be difficult these days with the ease of the supermarket. But if you can source your veggies from farmers markets, find a fish monger and possibly someone to supply goat milk/meat then you are golden. Will I eat like this 100%? Maybe not but I will try. My father lived to be 93 years old and his main staple was Olive oil, garlic, Onions, nuts, cheese, olives, veggies and meat/fish. What killed my father was processed food and sugar. He got dementia and I believe if the sugar was not involved, he would have lived to be 100+ years EASY!!! All my family lived to their 100’s. Anyway, this diet is fool proof if done 95% of the time but you also must source the food thoughtfully. Olives do not need to be from Greece although I prefer it, if they are from Southern Ca then I am ok with that. Olive oil on the other hand I prefer to buy from Greece. In-fact I purchase 20L of olive at a time from a small farm in Italy (Monopoli) which has 500+ year old trees from Greece. I know this way of life and eating is proven but I am also curious if it has something to do with genes as well or your DNA. I am nearly 75% Greek and the rest is a mixture of Sicilian, Albanian and some Welch, could have some Irish. lol That said, has anyone every looked into whether adopting a diet of another culture will provide what it provides for those people who live it and breath it? Anyway, nice site. Thank you! Thank you for sharing Jason! What a great story. Yes, there have been many studies that have showed that the Mediterranean diet is in fact beneficial to populations outside the Mediterranean. DNA also plays a role, they have seen this in the people of Ikaria who have an unusual high percentage of people living beyond 90.